To develop a decision forest for prediction of laser refractive surgery outcome. Data from consecutive cases of patients who underwent LASIK or photorefractive surgeries during a 12-year period in a single center were assembled into a single dataset. Training of machine-learning classifiers and testing were performed with a statistical classifier algorithm. The decision forest was created by feature vectors extracted from 17,592 cases and 38 clinical parameters for each patient. A 10-fold cross-validation procedure was applied to estimate the predictive value of the decision forest when applied to new patients. Analysis included patients younger than 40 years who were not treated for monovision. Efficacy of 0.7 or greater and 0.8 or greater was achieved in 16,198 (92.0%) and 14,945 (84.9%) eyes, respectively. Efficacy of less than 0.4 and less than 0.5 was achieved in 322 (1.8%) and 506 (2.9%) eyes, respectively. Patients in the low efficacy group (< 0.4) had statistically significant differences compared with the high efficacy group (≥ 0.8), yet were clinically similar (mean differences between groups of 0.7 years, of 0.43 mm in pupil size, of 0.11 D in cylinder, of 0.22 logMAR in preoperative CDVA, of 0.11 mm in optical zone size, of 1.03 D in actual sphere treatment, and of 0.64 D in actual cylinder treatment). The preoperative subjective CDVA had the highest gain (most important to the model). Correlations analysis revealed significantly decreased efficacy with increased age (r = −0.67, P < .001), central corneal thickness (r = −0.40, P < .001), mean keratometry (r = −0.33, P < .001), and preoperative CDVA (r = −0.47, P < .001). Efficacy increased with pupil size (r = 0.20, P < .001). This model could support clinical decision making and may lead to better individual risk assessment. Expanding the role of machine learning in analyzing big data from refractive surgeries may be of interest. Decision trees are created using advanced data analysis software that contains mathematical algorithms used to transform heterogeneous data to a simple practical conclusion.5 Based on part of the data, the software learns these patterns and tries to classify the following data according to the learned patterns. Decision trees have been used in age-related macular degeneration (to classify and predict retinal drusen type),6 glaucoma (to diagnose, classify, and identify progression based on clinical and imaging data),7,8 and detection of keratoconus.9 The decision tree analysis may locate new patterns that are not obvious using traditional statistical methods. Our aim was to build a decision forest, which is an ensemble of decision trees that may serve as a decision support tool with the hope that such a model may be used to estimate the risk of unsuccessful outcome based on the patient's preoperative demographic and clinical data. Therefore, the purpose of this study was to employ predictive machine learning models and large data sets for training to identify high-risk patients undergoing corneal laser refractive surgery. The design of the study followed the tenets of the Declaration of Helsinki and the study protocol was approved by the local institutional review board committee. Data were obtained through the computerized database registry of Care-Vision Laser Centers, Tel Aviv, Israel. The Database Registry includes patient demographic and clinical data variables, archived by an advanced computerized electronic record-keeping software system. Records are updated by the center's staff prospectively, during each patient's visit. For the current study, we used a computerized query to select patients with the following inclusion criteria: 17 to 40 years old, underwent LASIK or photorefractive keratectomy (PRK) treatment, and underwent at least 3 weeks of follow-up for LASIK and 3 months for PRK. Patients who were treated for monovision or hyperopia were excluded. Patients with a preoperative corrected distance visual acuity (CDVA) of 20/30 or worse were also excluded. Efficacy was calculated as the ratio of preoperative CDVA and postoperative uncorrected distance visual acuity (UDVA). Low efficacy was defined as less than 0.4 and high efficacy as 0.8 or greater. The regression task for predicting the efficacy can be converted into a binary classification task with a goal of determining whether the procedure was successful according to acceptable threshold. 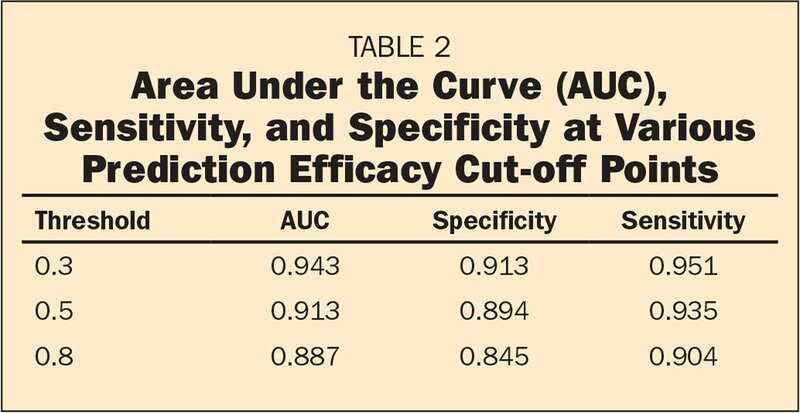 For example, a patient with efficacy greater than 0.5 was considered to be a positive case and correspondently a patient with efficacy lower than 0.5 was considered to be a negative case. One common approach for estimating the predictive performance of a classifier is to use the ROC curve, which demonstrates the performance over a range of trade-offs between true-positive and false-positive error rates.18 Each point in the curve corresponds to a particular cut-off, having the false-positive value (1-specificity) as x-axis and the sensitivity value as y-axis. Points closer to the upper right corner correspond to lower cut-offs; points closer to the lower left corner correspond to higher cut-offs. The choice of the cut-off thus represents a trade-off between sensitivity and specificity. A low cut-off usually yields a higher sensitivity. Conversely, a high cut-off yields a lower false-positive rate at the price of lower sensitivity. In terms of classifier comparison, the best curve is the one that is leftmost, the ideal one coinciding with the y-axis. Thus, the area under the curve (AUC) is an accepted performance metric for an ROC curve.19 The AUC range is 0 to 1. The area under the diagonal is 0.5. This value represents a random classifier. On the other hand, a value of 1 represents an optimal classifier. Figure 1 presents the ROC curves obtained for the proposed model. The diagonal line indicates the curve is a random (null) model with an AUC of 0.5. All patients underwent either LASIK or PRK in a similar manner. The decision to perform LASIK or PRK was left to the discretion of the surgeon. The common practice in our institution is not to perform LASIK when the central corneal thickness is less than 500 μm. One drop of a topical anesthetic (benoxinate hydrochloride 0.4%) was instilled in the conjunctival fornix of the eye prior to surgery, after which an eyelid speculum was inserted. A Moria microkeratome (Moria SA, Antony, France) with a thickness plate of 90 μm was used to create the flap in LASIK cases and epithelial removal was performed via alcohol-assisted PRK (20% ethyl alcohol placed on the cornea for 15 seconds) in PRK cases. Following flap creation (LASIK) or epithelial removal (PRK), the WaveLight Allegretto Wave (EX200) excimer laser system (Alcon Laboratories, Inc., Hüenberg, Switzerland) was used. In all PRK cases, a sponge soaked with 0.02% mitomycin C was placed on the stroma for 20 to 60 seconds (depending on the amount of ablation) following excimer ablation and a contact lens was placed after rinsing the mitomycin C. Following surgery, patients were prescribed moxifloxacin 0.5% (four times a day), dexamethasone 0.1% (two or four times a day), and artificial tears (four times a day). Patients were examined at 1 day, 1 week, 1, 3, and 6 months postoperatively, and more if necessary. Statistical analysis was performed using SPSS software (version 23; IBM Corporation, Armonk, NY). Clinical parameters distribution was tested for normality by the Shapiro–Wilk test. Because none of the continuous parameters distributed normally, we used the Wilcoxon signed-rank test and the Mann–Whitney U test for comparison of related and unrelated variables, respectively. We conducted the chi-square test for categorical variables using MedCalc software (version 12.5; MedCalc Software, Inc., Mariakerke, Belgium). Spearman correlation was calculated for continuous variables. A P value of less than .05 on a two-sided test was considered statistically significant. The computerized query yielded 43,257 cases, of which 17,592 met our criteria for inclusion and exclusion. The patients' mean age was 26.5 ± 5.3 years (range: 20 to 40 years), 9,381 (53.5%) were men and 8,211 were women (46.5%), and 8,879 (50.5%) of cases included the right eye and 8,713 (55.5%) included the left eye. PRK was conducted in 7,829 (44.5%) of cases and LASIK in the remaining 9,763 (55.5%). Preoperative CDVA was 1.03 ± 0.18 decimal (Snellen 20/20) and UDVA was 0.0 ± 0.08 decimal (Snellen 20/200). The UDVA following surgery improved to 0.97 ± 0.21 decimal (Snellen 20/20.6) (P < .0001). Efficacy of 0.7 or greater and 0.8 or greater was achieved in 16,198 (92.0%) and 14,945 (84.9%) eyes, respectively. Efficacy of less than 0.4 and less than 0.5 was achieved in 322 (1.8%) and 506 (2.9%) eyes, respectively. Analysis by surgery type revealed that LASIK and PRK were effective, with both achieving very high efficacy (PRK: 0.97 ± 0.19, LASIK: 0.95 ± 0.22, P < .001). 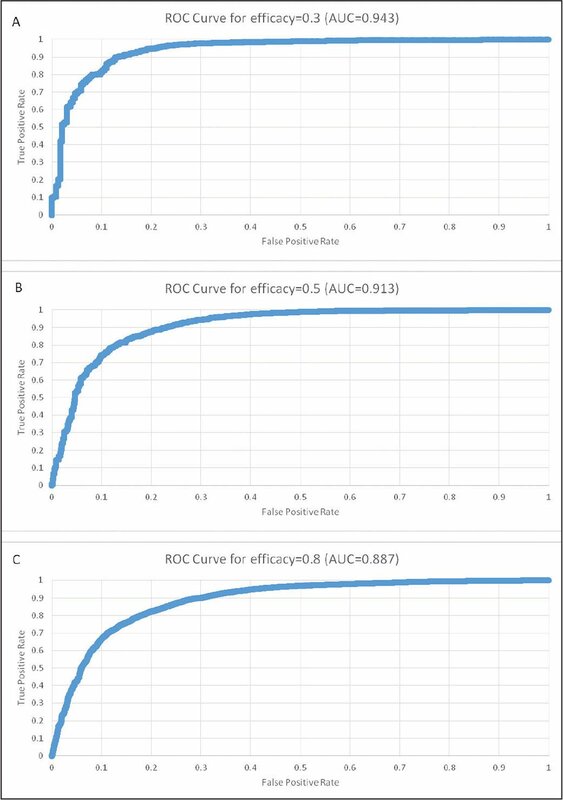 Table 1 depicts the differences between the low efficacy and high efficacy groups. The groups had statistically significant differences, but were clinically similar. For example, patients in the low efficacy group were some-what older (27.2 ± 5.8 vs 26.5 ± 5.7 years, P = .01), with smaller scotopic pupil size (5.29 ± 1.30 vs 5.74 ± 1.10 mm, P = .001) and lower treatment parameters for both the sphere (−2.36 ± 2.19 vs −3.38 ± 2.04 D, P < .001) and the cylinder (−0.11 ± 0.78 vs −0.48 ± 0.77 D, P < .0001). Correlations analysis revealed significantly decreased efficacy with increased age (r = −0.67, P < .001), central corneal thickness (r = −0.40, P < .001), mean keratometry (r = −0.33, P < .001), and preoperative CDVA (r = −0.47, P < .001). Efficacy increased with pupil size (r = 0.20, P < .001). Based on clinical parameters available to us (demographic, biometric, and preoperative data), we predicted the postoperative efficacy for each patient. The predicted efficacy variable correlated well with the actual post-operative efficacy (r = 0.72, P < .001). The efficacy prediction variable was higher than 0.7 in only 173 cases (0.009% of our sample), whereas the actual efficacy was lower than 0.5. Moreover, frequency analysis of efficacy (actual efficacy – predictive efficacy) showed that 11,122 (63.2%) of all cases were within ±10%, 15,019 (85.37%) were within ±20%, and 16,297 (92.63%) were within ±30% (Figure 2). 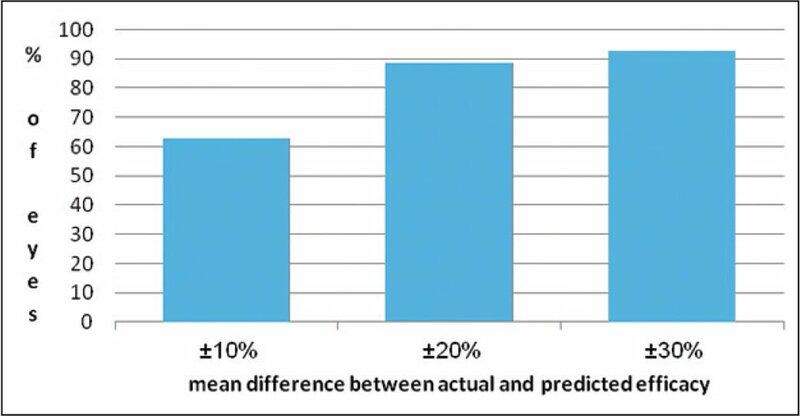 We could not find any clinical meaningful difference between patients with high inaccurate prediction (> ±30%) and those with a more accurate prediction. Frequency histogram of the differences between actual and predictive efficacy. Figure 1 presents the ROC curve obtained for the proposed model for efficacy of 0.3 (AUC = 0.943), 0.5 (AUC = 0.9113), and 0.8 (AUC = 0.887). We extracted the specificity and sensitivity from each graph at the point that maximizes their average (ie, [specificity + sensitivity] / 2). The results of each model were high (Table 2). Analysis of features that most affected the model for binary classification (achieved efficacy 0.5 or not) revealed that the preoperative subjective CDVA had the highest gain (ie, more important for generating the prediction) and was followed by surgical treatment parameters (the amount of sphere and cylinder treatment [D]). In this study, a statistical classifier algorithm was used to maximize the use of big data. This study demonstrates several interesting clinical factors that may contribute to unsatisfactory results. Patients in the low efficacy group had statistically significant differences when compared with the high efficacy group, but the groups were similar clinically. It may be that our approach of big data analysis is most suitable to detect rare outcomes, as in modern refractive surgery. A single clinical parameter, by itself, may contribute to only a small risk for failure. However, using a comprehensive approach and modeling increment of risk induced by the various clinical parameters, this study was able to detect patients who may have a worse outcome. It should be noted that the data were generated from a single center only. Care should be taken when transferring our results to other institutions. Therefore, we advise surgeons to conduct individual statistical analysis to improve quality management and outcomes of their future surgeries. We believe that the high accuracy achieved by the automated classification resulted from evaluation of multiple clinical parameters. The automated classification may assist in the detection of high-risk patients. 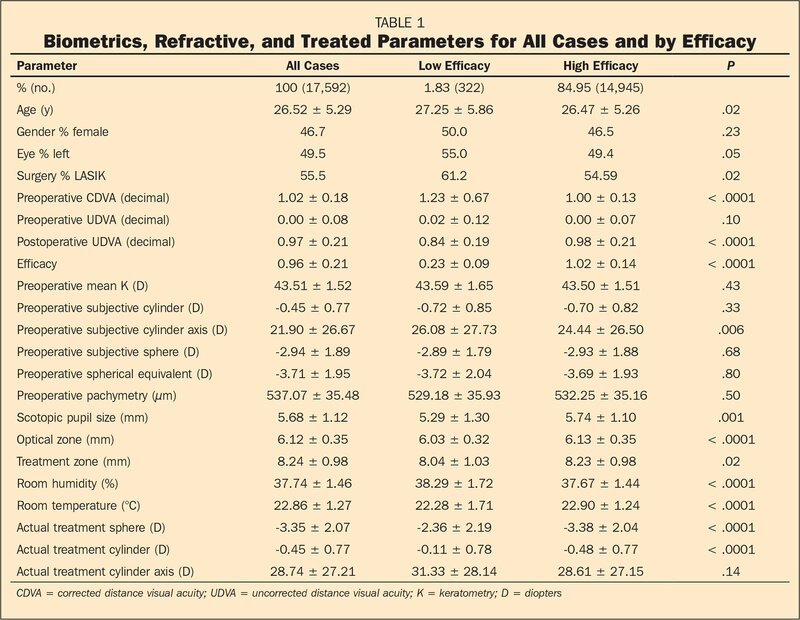 Moreno-Barriuso E, Lloves JM, Marcos S, Navarro R, Llorente L, Barbero S. Ocular aberrations before and after myopic corneal refractive surgery: LASIK-induced changes measured with laser ray tracing. Invest Ophthalmol Vis Sci. 2001;42:1396–1403. Chen T, Guestrin C. Xgboost: a scalable tree boosting system. arXiv preprint arXiv:160302754 2016. Rashmi K, Gilad-Bachrach R. Dart: dropouts meet multiple additive regression trees. arXiv preprint arXiv:150501866 2015. Hajian-Tilaki K. Receiver operating characteristic (ROC) curve analysis for medical diagnostic test evaluation. Caspian Journal of Internal Medicine. 2013;4:627–635. Florkowski CM. Sensitivity, specificity, receiver-operating characteristic (ROC) curves and likelihood ratios: communicating the performance of diagnostic tests. Clin Biochem Rev. 2008;29(suppl 1):S83–S87. From the Department of Ophthalmology, The Edith Wolfson Medical Center, Holon, Israel (AA, UA, LK); Sackler School of Medicine, Tel Aviv University, Israel (AA, UA, LK); the Department of Ophthalmology, Soroka University Medical Center, Ben-Gurion University of the Negev, Beer-Sheva, Israel (ZG); the Department of Ophthalmology, Kaplan Medical Center, Rehovot (AH); Hebrew University-Hadassah Medical School, Jerusalem, Israel (AH); the Department of Ophthalmology, Rambam Health Care Campus, Haifa, Israel (MM); the Department of Software and Information Systems Engineering, Ben-Gurion University of the Negev, Beer-Sheva, Israel (LR); the Department of Ophthalmology, Barzilai Medical Center, Ashkelon, Israel (IK); and the Faculty of Health Sciences, Ben-Gurion University of the Negev, Beer-Sheva, Israel (IK).